MRB-0202 - Wonderful photographic art on a rocker blotter. The writing in the upper left corner says Luzern. 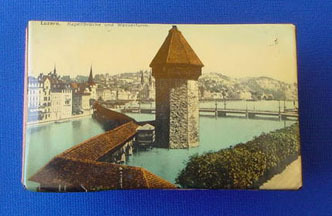 Kapellbrücke Und Wasserturm. Will definitely add interest to your already interesting desk top. Dimensions. 5w X 3-1/8d x 1-1/2h. Weight is 3 oz. Priced right at $45.00 and has a blotter in place.